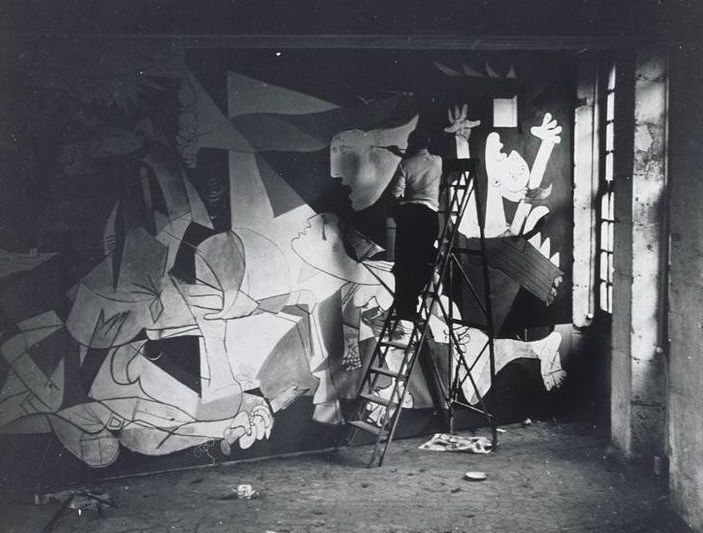 Pablo Picasso painting Guernica in the spring of 1937. Pablo Picasso painted Guernica in just five weeks in the spring of 1937. Then living in Paris, Picasso, fifty-five, was already well-known. Born in Spain in 1881, he went to Paris in 1900; he had visited Spain in 1934 but would never return. Still, the insurgent Popular Front government appointed him director of the Prado Museum in Madrid, in absentia, and Picasso undertook several projects sympathetic to the Republic and to raise funds on its behalf. The government in turn asked him to produce a mural for the 1937 Paris World’s Fair, and he agreed, though progress at first was slow. It was the April 26 attack at Guernica that moved him. He threw himself into the painting and in less than five weeks, astonishingly, had completed Guernica. Guernica , massive in size, composed in mixtures of black and gray and white, is a picture of an air raid. It is twenty-five and a half feet long and more than eleven and a half feet in height. In July 1937, the mural was installed in the entrance to the Republic’s Spanish Pavilion amid controversy. The Right objected to the subject matter altogether, while the Left found it obscure. [A] profoundly subjective work — and it is from this that its power derives. Picasso did not try to imagine the actual event. There is no town, no aeroplanes, no explosion, no reference to the time of day, the year, the century, or the part of Spain where it happened. There are no enemies to accuse. There is no heroism. And yet the work is a protest — and one would know this even if one knew nothing of its history. The powerful anarchist workers’ organizations, the National Confederation of Labor (CNT) and the Iberian Anarchist Federation (FAI), broke with all past practice and abandoned their call for electoral abstention, which they sloganized as No Votad. This decision cemented the Left’s victory, inflicting a humiliating defeat on the center and the Right. While revolution was not on the ballot, the election helped clear a path for one. By midsummer, a dual-power state developed in Barcelona, if not across all of Spain. In the countryside — Spain remained overwhelmingly rural — peasants seized the great estates and collectivized them; in cities, workers took control of factories and governments. Then, in July, the Right — the fascists calling themselves nationalists — replied: the generals revolted. The uprising began in Spain’s North African colony Morocco, where an army of mercenaries, legionnaires, and Moroccans was assembled as the ruling class’s shock troops. Soon, fascist general Francisco Franco took the lead, crossing into Spain and commanding a drive to the north, where, in Madrid, Barcelona, Malaga, and the industrial centers of Asturias and Catalonia, the workers were in rebellion. In these places, soldiers joined the workers; they mutinied, turned over their weapons to the revolutionaries, or were trapped in their barracks. If the generals meant to forestall the revolution, instead they provoked it. Practically every building of any size had been seized by the workers and was draped with red flags or with the red and black flag of the anarchists; every wall was scrawled with the hammer and sickle and with the initials of the revolutionary parties; almost every church had been gutted and its images burnt. Churches here and there were being demolished systematically by gangs of workmen. This would not last. Franco’s troops, now backed by German and Italian arms, steadily advanced. As nationalist victories mounted, the situation in the Republic became increasingly desperate — only the epic battles at Jarama and Guadalajara saved Madrid. There, heroic resistance from Spanish militias and international brigades held off the fascists, although at great cost. These, tragically, were the last victories. The middle classes responded by insisting that winning the war must come first and revolution, if at all, later — much later. The revolution, they claimed, was undermining the war effort and making the imagined intervention from the French or British impossible. They demanded that the armed forces reinstate hierarchy and discipline, that the workers’ militias disarm, and that the peasant revolution come to an end. The increasingly large and powerful Communist Party, following the Soviet Union’s dictates, supported them. Guernica, the most ancient town of the Basques and the centre of their cultural tradition, was completely destroyed yesterday afternoon by insurgent air-raiders. The bombardment of the open town far behind the lines occupied precisely three hours and a quarter, during which the powerful fleet of aeroplanes consisting of three German types, Junkers and Heinkel bombers and Heinkel fighters, did not cease unloading on the town bombs weighing from 1000 lb. downward. . . The fighters meanwhile flew low from above the centre of the town to machine-gun those of the civilians who had taken refuge in the fields. The whole of Guernica was soon in flames except the historic Casa de Juntas. The attack could not have come at a worse time for the Republic. While the fascist offensive continued, the Communist Party struck militarily against the POUM and the CNT. Five hundred people died in house-to-house fighting. The Republic outlawed POUM in June, and Stalinist agents murdered the party’s leader, Andres Nin, soon after. The prime minister, Largo Caballero, leader of the Spanish Socialist Workers Party and the Workers General Union (CGT) was forced from office. Although Picasso was painting Guernica at the time, and it was certainly discussed within his circle, his painting tells us next to nothing of his opinion of these events. The German and Italian governments handed victory to Franco and his army, installing a fascist government that would last for thirty-six years. Soon all of Europe would be at their mercy. After Paris, Guernica traveled to the United States in order to raise money for Spanish refugees, shown first at the San Francisco Museum of Art, then in New York at the Museum of Modern Art. Picasso requested that it remain in New York for safekeeping and that it be returned to Spain only when democracy had been restored. In 1981, the mural came home and is now installed at the Museo Nacional Centro de Arte Reina Sofia in Madrid. Guernica represented the first instance of a new kind of war. The Blitz followed it, then Dresden and the firebombing of Tokyo. Then Hiroshima. The “saturation” bombing of Vietnam — a nation virtually defenseless from the air — left millions dead. Now we have watched Fallujah and Aleppo and Mosul, while today the United States bombs seven countries simultaneously: Afghanistan, Pakistan, Iraq, Syria, Yemen, Somalia, and Libya. Life, says the painting [ Guernica ], is an ordinary, carnal, entirely unnegotiable value. It is what humans and animals share. There is a time of life, which we inhabit unthinkingly, but also a time of death: the two may be incommensurable, but humans especially — from the evidence of Paleolithic burials it seems a human defining trait — structure their lives, imaginatively, in relation to death. They try to live with death — to keep death present, like the ancestors whose bones they exhume and re-enter. But certain kinds of death break that human contract. And this is one of them, says Guernica . Life should not end the way it does here. Some kinds of death, to put it another way, have nothing to do with the human as Picasso conceives it — they possess no form as they take place, they come from nowhere, time never touches them, they do not even have the look of doom. They are a special obscenity, and that obscenity, it turns out, has been a central experience for seventy years.